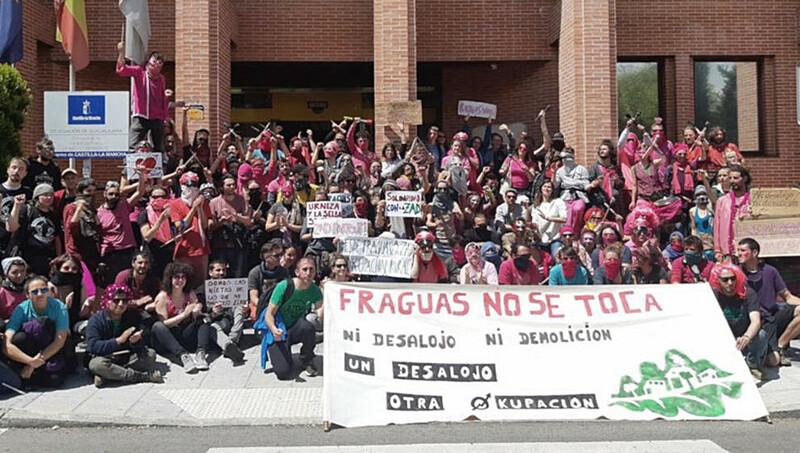 The Provincial Court confirms the sentence to the residents of Fraguas The six convicted youths say they will not pay for the demolition of the town, so the prison sentence could be extended to two years and three months. 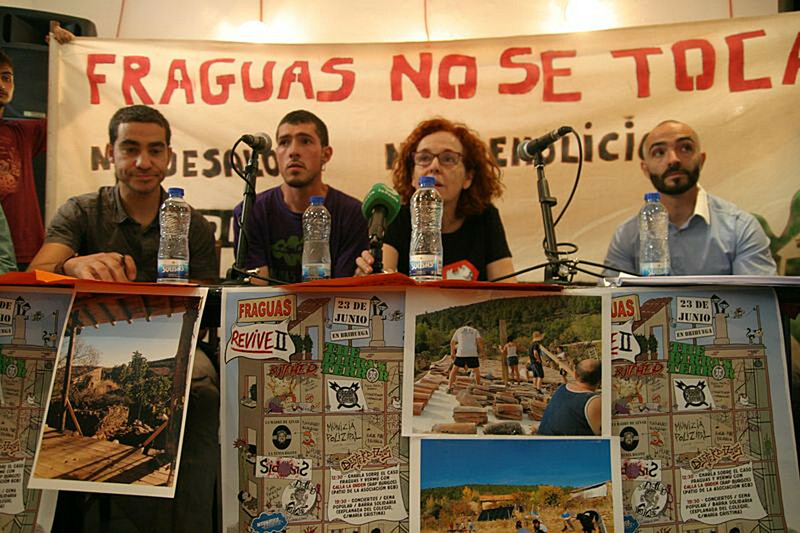 The National Court of Guadalajara has rejected the appeal lodged by the inhabitants of the village of Fraguas and has confirmed the sentence of the six young people. 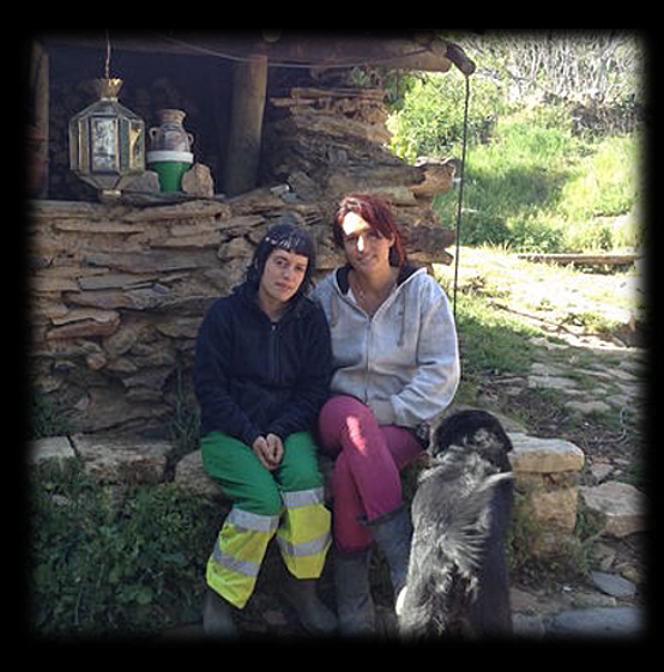 The village of Fraguas, one of hundreds evicted half a century ago by the Franco regime, became in 2012 home to a dozen people who spent five years rebuilding it. 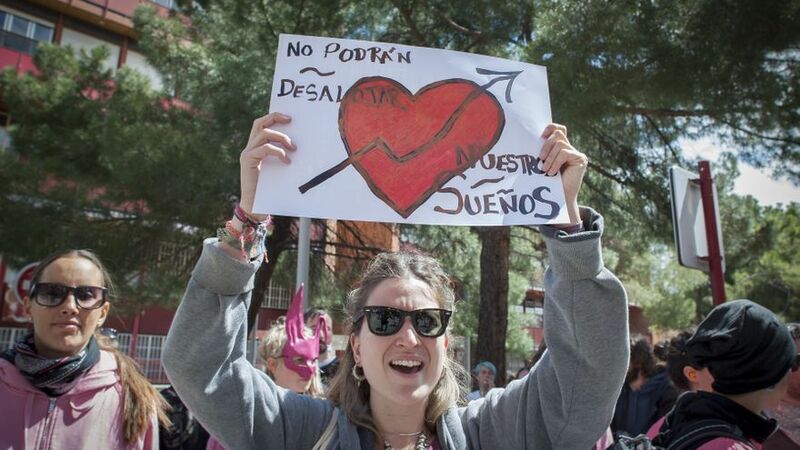 A large demonstration in defense of Fraguas has been organized on 23 February in Madrid, which will depart at noon at Plaza de Tirso de Molina. In May, six of the people who lived or worked in the reconstruction of the town were tried for crimes against the ordination of the territory and usurpation, accused by the Board of Communities of Castilla-La Mancha. Last year the 1st Court of Guadalajara sentenced each of them to one year and six months in prison for ”crimes against the ordination of the territory”, in addition to the payment of a fine of 1,080 euros for the same crime and another one year fine -2,160 euros- for usurpation, in addition to the demolition payments. The sentence was appealed before the Provincial Court, which has now notified the rejection of the appeal and has confirmed the sentence. “It is shameful, there are four people who do not even live here and they have been condemned the same, they remain in their thirteen”, regrets Lalo Aracil, one of the condemned youths. 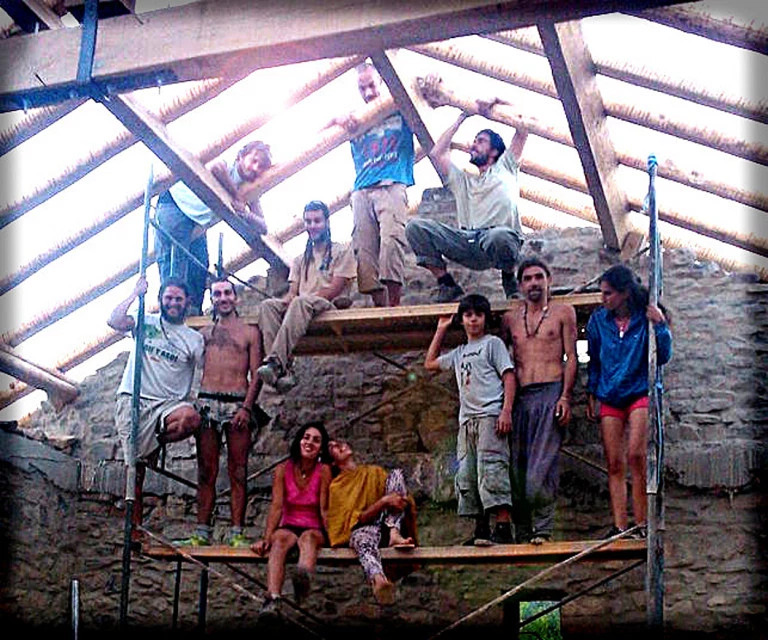 Aracil has announced that the six convicts have decided not to pay for the demolition. “What we have raised with so much effort and money, we are not going to dedicate a single cent of our resources or those of social movements to demolish it,” he says. This decision could entail the effective entry into prison of the four young people, and for a total of two years and three months. 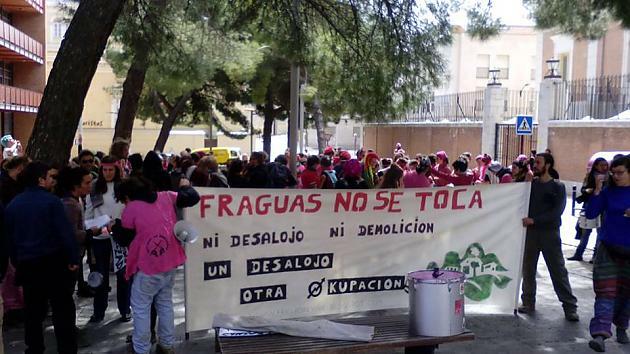 According to Aracil, the demolition of the houses of Fraguas, valued at more than 26,000 euros, would have priority over the payment of fines, so that, until the first was paid, the second ones could not be paid. The year and a half of the unpaid fine would become nine months in prison to add to the sentence of one year and six months. The six young people affirm that they will appeal to the Constitutional Court and that they will continue in Fraguas. “We know that legal security is null, but we continue with strength and integrity to continue defending it, we are not going to leave here,” says Aracil. “If it is movable, there would be no crime against the ordination of the territory; if there is an offense against the ordination of the territory, in any case it would be usurpation of public forest, which would go by administrative, not criminal procedure”. 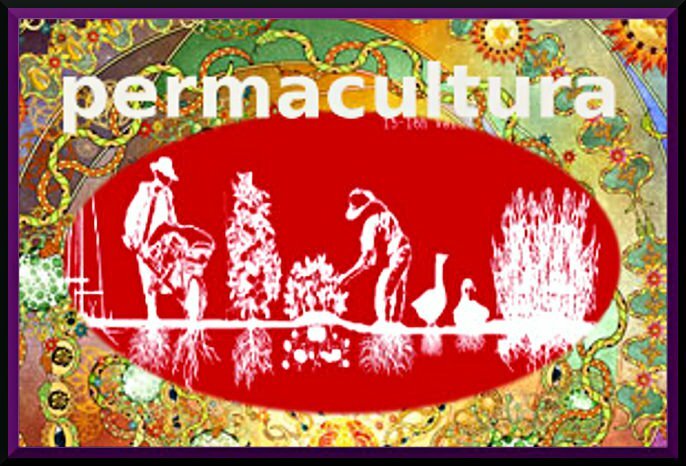 We believe and fight for the community, self-government, self-sufficiency and self-management. Since we arrived we were “invited” to abandon our dreams by environmental agents and civil guards with threats and fines, some of us carry thousands of euros in fines. 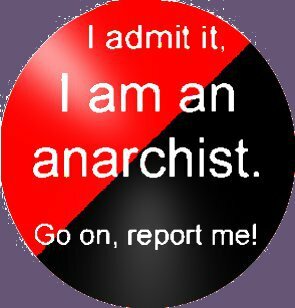 What bothers me is that politicians then fill their mouths talking about affordable housing, the need to fight against squatters who use private property, and these guys solve the problem themselves and that’s what that do not accept, the self-sufficiency of people. You have to go through the hoop or nothing. Fraguas is inside a ‘Natural’ Park. It is as if I now a “repueblo” inside Ordesa (or Retiro), because it comes out of the reproductive system. There are THOUSANDS of abandoned villages that can be repopulated without having to put one in a Natural Park (Sierra Norte Natural Park, Guadalajara). You yourself say that they “repopulate”, that is, they repopulate a territory that was populated. I think they are in their right, even though it is a Natural Park. Another thing is if it was a forest and they were going to build on it. For my part I admire the integrity and courage of these young people. You have to have many guts to stay there in these hard times . 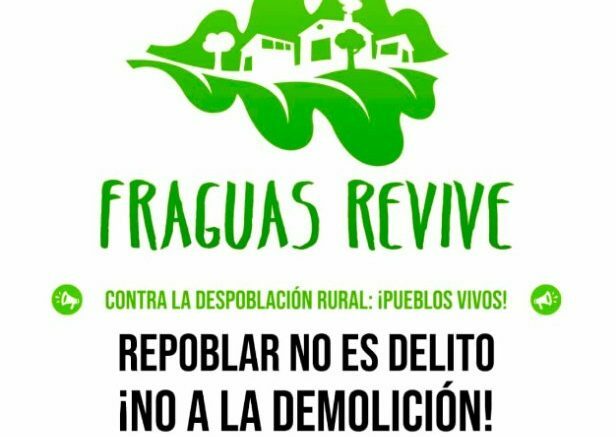 Fraguas will now be in a natural park, all destroyed and giving a good image of our beloved Spain of the Franco years, who did good deeds, forcibly evicting all those people who lived there, as you mention it in Huesca , villages forcibly abandoned by the greed of a few. Dothose people who are repopulating that town hurt anyone???? ….. I wish we had the guts like these to do what they do, raise a town. Viva Fraguas ….. repopulated. 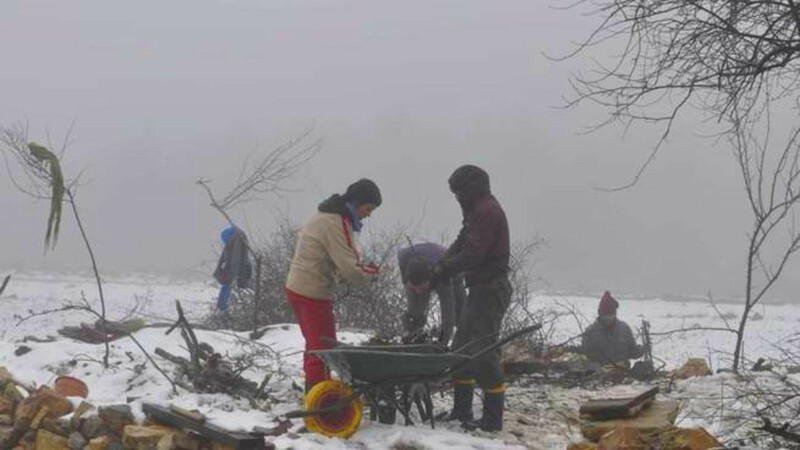 It is normal to first make the typical propaganda of the problem of abandoned villages, but what people do not know is that all these people are in the hands of religious foundations (Opus Dei), who officially decide for these lands, that is, the only thing they expect is the opportunity to sell them (do business with them). If you do not consume you are not worth anything, and they put you in jail or put you to sleep in the street, capitalist society has always worked like this, I do not know why people are surprised. 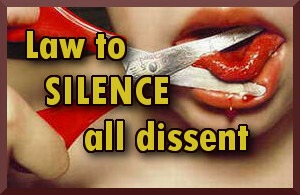 People do not vote or vote for those who support it, we all know many, and we are all partly guilty. «60% of the Spanish municipalities have less than 1,000 inhabitants, they occupy 40% of the surface, but hardly have 3% of the population». This is how administrations treat young people’s attempts to carve out a future. 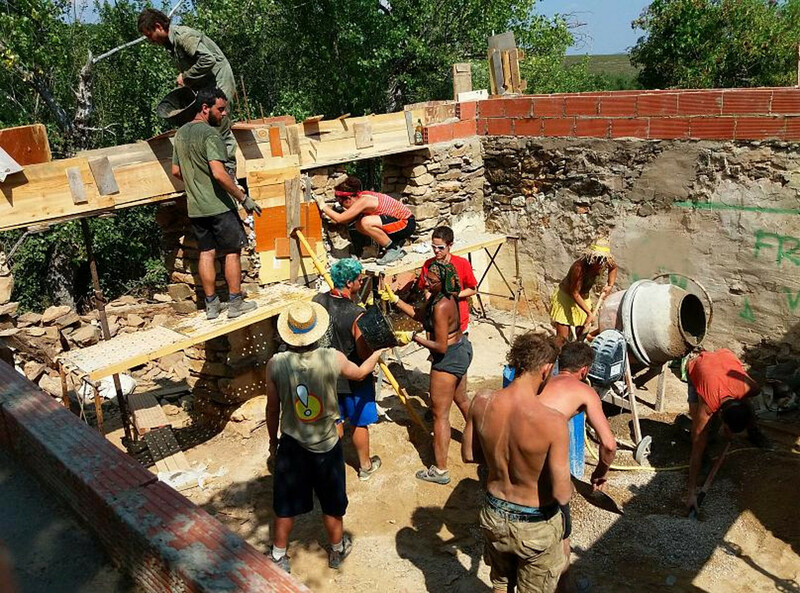 El poble de Fraguas, desallotjat durant mig segle pel règim franquista, es va convertir el 2012 en la llar d’una dotzena de persones que van dedicar cinc anys a la seva reconstrucció. Al maig, sis de les persones que vivien o treballaven en la reconstrucció del poble van ser jutjades per delictes contra l’ordenació del territori i usurpació, acusades per la Junta de Comunitats de Castella-La Manxa. 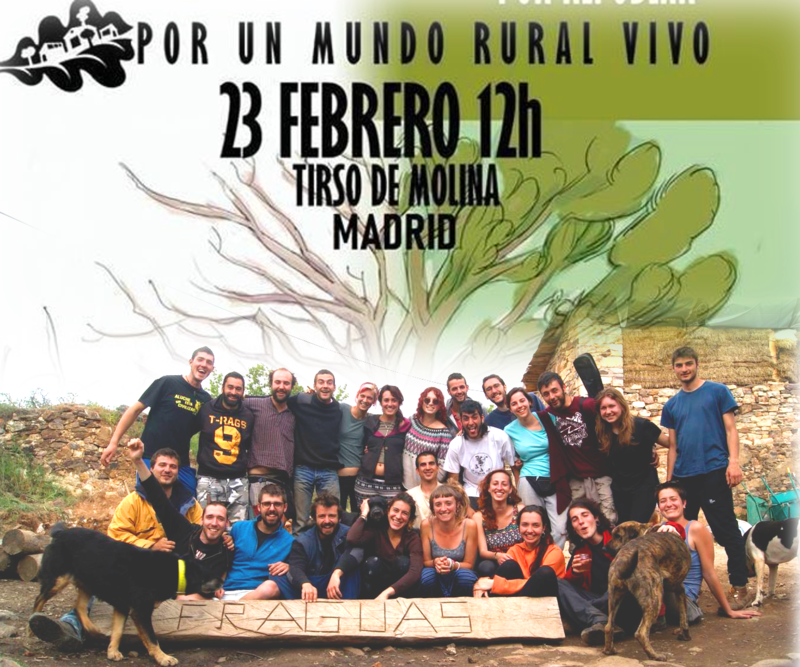 Por otra parte, recordaba que en protesta de esa gestión política del medio rural y en defensa de proyectos como el de Fraguas se ha organizado una gran manifestación el próximo 23 de febrero en Madrid, que partirá a las doce del mediodía de la Plaza de Tirso de Molina. Al juny, el Jutjat número 1 de Guadalajara les va condemnar, a cadascuna d’elles, a un any i sis mesos de presó per delictes contra l’ordenació del territori, a més del pagament d’una multa de 1.080 euros pel mateix delicte i a una altra multa d’un any —2.160 euros— per usurpació, a més del pagament de la demolició. La sentència va ser recorreguda davant l’Audiència Provincial, que ha notificat el rebuig del recurs i ha confirmat la condemna. “És vergonyós, hi ha quatre persones que ni tan sols viuen aquí i les han condemnat igual, es mantenen en les seves tretze”, lamenta Lalo Aracil, un dels joves condemnats. Aracil ha anunciat que els sis condemnats han decidit no pagar la demolició. “Al que amb tant esforç i diners hem aixecat no li dedicarem ni un sol cèntim dels nostres recursos ni dels moviments socials per a derrocar-lo”, afirma. Aquesta decisió podria comportar l’entrada efectiva a la presó de les quatre joves, i per un total de dos anys i tres mesos. Segons explica Aracil, la demolició de les cases de Fraguas, taxada en més de 26.000 euros, tindria prioritat sobre el pagament de les multes, fet pel qual, fins que no es pagués la primera, no es podrien pagar les segones. L’any i mig de multa impagada es convertiria en nou mesos de presó a sumar a la condemna d’any i sis mesos. Els sis joves afirmen que recorreran davant el Tribunal Constitucional i que continuaran a Fraguas. “Sabem que la seguretat jurídica és nul·la, però seguim amb força i enteresa per a continuar defensant-ho, nosaltres no marxarem d’aquí”, sosté Aracil. Aquest activista assenyala que se’ls ha condemnat alhora per usurpació de béns immobles i per delictes contra l’ordenació del territori: “Si és bé moble no hi hauria delicte contra l’ordenació del territori; si hi ha delicte contra l’ordenació del territori, en tot cas seria usurpació de muntanya pública, que aniria per via administrativa, no penal”. 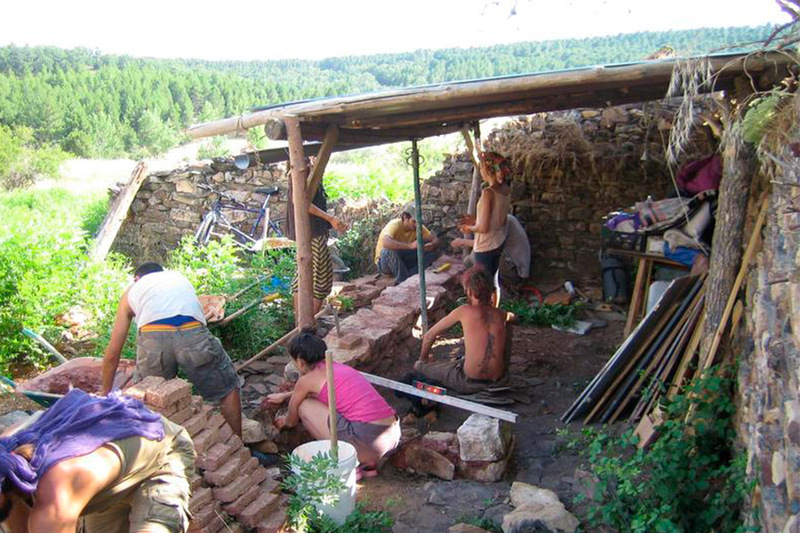 També subratlla que en el cas del poble de Fraguas no es compleix cap dels supòsits perquè els fets fossin constitutius de delicte: “És una reconstrucció, no hem urbanitzat ni hem edificat, ni tenim ànim de lucre. És una llei per a prevenir excessos immobiliaris per la que amb prou feines hi ha una dotzena de condemnes, i ens han condemnat a nosaltres”. La Audiencia Nacional de Guadalajara ha rechazado el recurso interpuesto por los habitantes del poblado de Fraguas y ha confirmado la condena a los seis jóvenes. 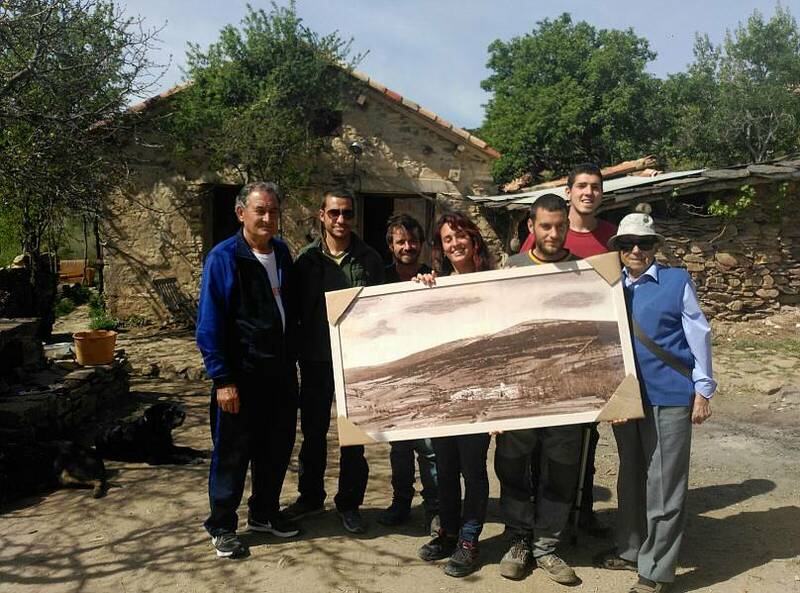 El pueblo de Fraguas, desalojado durante hace medio siglo por el régimen franquista, se convirtió en 2012 en el hogar de una docena de personas que dedicaron cinco años a su reconstrucción. En mayo, seis de las personas que vivían o trabajaban en la reconstrucción del pueblo fueron juzgados por delitos contra la ordenación del territorio y usurpación, acusados por la Junta de Comunidades de Castilla-La Mancha. En junio, el Juzgado número 1 de Guadalajara les condenó, a cada uno de ellos, a un año y seis meses de cárcel por delitos contra la ordenación del territorio, además de al pago de una multa de 1.080 euros por el mismo delito y a otra multa de un año —2.160 euros— por usurpación, además del pago de la demolición. La sentencia fue recurrida ante la Audiencia Provincial, que hoy ha notificado el rechazo del recurso y ha confirmado la condena. “Es vergonzoso, hay cuatro personas que ni siquiera viven aquí y se les ha condenado igual, se mantienen en sus trece”, lamenta Lalo Aracil, uno de los jóvenes condenados. Aracil ha anunciado que los seis condenados han decidido no pagar la demolición. “A lo que con tanto esfuerzo y dinero hemos levantado no le vamos a dedicar ni un solo céntimo de nuestros recursos ni de los de los movimientos sociales para derribarlo”, afirma. Esta decisión podría conllevar la entrada efectiva en prisión de los cuatro jóvenes, y por un total de dos años y tres meses. Según explica Aracil, la demolición de las casas de Fraguas, tasada en más de 26.000 euros, tendría prioridad sobre el pago de las multas, por lo que, hasta que no se pagase la primera, no se podrían pagar las segundas. El año y medio de multa impagada se convertiría en nueve meses de prisión a sumar a la condena de año y seis meses. Los seis jóvenes afirman que recurrirán ante el Tribunal Constitucional y que van seguir en Fraguas. “Sabemos que la seguridad jurídica es nula, pero seguimos con fuerza y entereza para seguir defendiéndolo, nosotros no nos vamos a ir de aquí”, sostiene Aracil. Este activista señala que se les ha condenado a la vez por usurpación de bienes inmuebles y por delitos contra la ordenación del territorio: “Si es bien mueble no habría delito contra la ordenación del territorio; si hay delito contra la ordenación del territorio, en todo caso sería usurpación de monte público, que iría por vía administrativa, no penal”. También subraya que en el caso del pueblo de Fraguas no se cumple ninguno de los supuestos para que los hechos fueran delito: “Es una reconstrucción, no hemos urbanizado ni hemos edificado, ni tenemos ánimo de lucra. Es una ley para prevenir desmanes inmobiliarios por la que apenas hay una docena de condenas, y nos han condenado a nosotros”. 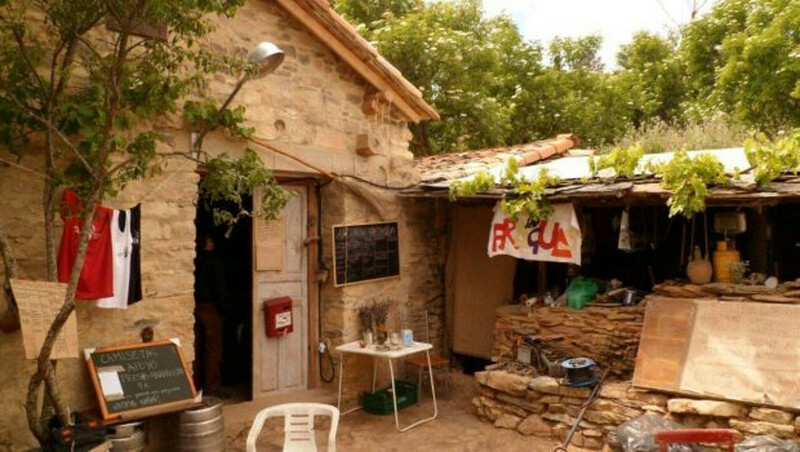 Como pueden decir que mover dos piedras de una ruina abandonada para reconstruir (no construir) una casa (no un chalet, campo de golf o hotel) es un “delito a la naturaleza”, pero luego, con dos cojones van a comprar una piña en el supermercado que ha sido traída de Brasil con un barco que quema toneladas de petroleo, luego va a ponerse a ver la tele con la electricidad que genera la central nuclear mas cercana, luego van a navegar por internet con su ordenador super natural hecho con componentes electrónicos que necesitan minerales extraídos de Africa por niños soldados… PERO QUE COJONES TIENEN!! Lo que fastidia es que luego los políticos se llenen la boca hablando de vivienda asequible, de luchar contra los okupas que usan la propiedad privada, y estos chicos que no hacen ni una cosa ni otra, se solucionan el problema por si mismos y eso lo que no aceptan, la autosuficiencia de las personas. Hay que pasar por el aro o nada. Fraguas está dentro de un Parque Natural. Es como si yo ahora “repueblo” dentro de Ordesa (o del Retiro), porque me sale del aparato reproductor. Hay MILES de pueblos abandonados que se pueden repoblar sin que se tenga que meter uno en un Parque Natural (Parque Natural de la Sierra Norte, Guadalajara). Tú misma/o dices que “repueblan”, esto es, vuelven a poblar un territorio que estaba poblado. Creo que están en su derecho aunque sea Parque Natural. Otra cosa es que fuera un bosque y entraran a construir. Por mi parte admiro la entereza y valentía de estos jóvenes. Hay que tener muchas agallas para mantenerse ahí en estos tiempos de lástima. 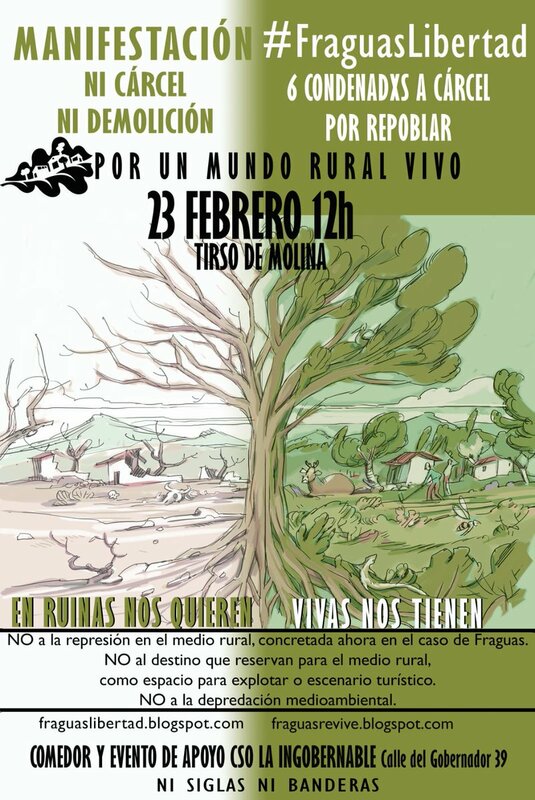 Fraguas estará ahora en un parque natural, todo destruido y dando una imagen buena de nuestra España querida de los años de Franco, que hizo buenas obras , echando a la fuerza a toda esa gente que vivía ahí, al igual ya que lo mencionas en Huesca , pueblos abandonados a la fuerza por la avaricia de unos cuantos. Hacen daño esa personas que están repoblando ese pueblo ???? a caso roban a alguien., hay algunos que ni coméis ni dejáis hacerlo. Ojala tuviésemos las agallas muchos como estos de hacer lo que hacen, levantar un pueblo. Viva Fraguas….. repoblada. Es normal que primero se haga la típica propaganda del problema de pueblos abandonados, pero lo que no sabemos es que todos estos pueblos están en manos de fundaciones religiosas (Opus Dei), quienes oficialmente deciden por estas tierras, es decir, lo único que esperan es la oportunidad de venderlas (hacer negocios con ellas). Si no consumes no les vales de nada,y te meten en la cárcel o te ponen a dormir en la calle,la sociedad capitalista siempre a funcionado así ,no se de qué se sorprende la gente.Culpables son los que no votan o votan por los que la sostienen ,todos conocemos a muchos ,y todos somos en parte culpables. Así tratan las administraciones los intentos de la juventud por labrarse un futuro.